* This Vintage Wedding Tiara or Bridal Headband has a Renaissance design of dazzling Crystals & Soft Ivory Pearls in Antique Silver measuring 5 1/2" around x 1 1/4" h.
* Buy this Retro Tiara Headband for a crowning touch to a romantic Victorian Wedding! * This Antique silver rhodium Wedding Tiara or Bridal Headband boasts an intricate design of glistening Crystal rhinestone leaves and scattered hand-wired Soft Ivory Pearls. 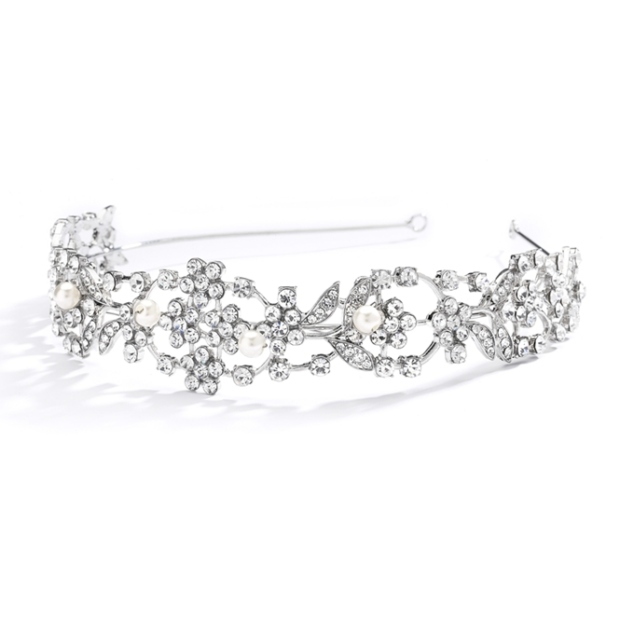 * This popular heirloom style Bridal Tiara or Headband adds delicate shimmer to Weddings, Proms, Graduations and Homecomings at a great price that makes special occasions even sweeter!